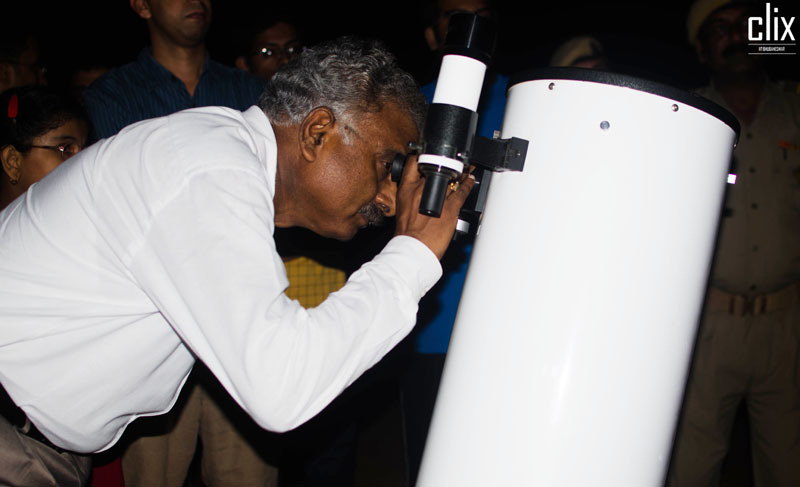 13th April 2019, Bhubaneswar: Under the able supervision of Prof. R. V. Rajakumar, Honorable Director IIT Bhubaneswar with NISER Astronomy Club in collaboration with Nakshatra, the astronomy society of IIT Bhubaneswar along with Student Body, NISER successfully organized a live astronomy session at the MHR Sports ground of IIT Bhubaneswar located in its sprawling campus at Argul. The aim was to facilitate widespread access to new knowledge and observing opportunities for students in the field of astronomy. The transit of the International Space Station (ISS) in front of the Moon (which is a rare event) was successfully captured through one of the five telescopes having an aperture of 11" as the ISS was passing through Jatni skies. The event was well attended by about 100 students, faculty, staff members and their families between 18:00-20:00 hrs. Mr. Jatin Khare, Secretary Science and technology, Students’ Gymkhana and Dr. Chandrasekhar Bhamidipati, School of Basic Sciences welcomed Prof. R. V. Rajakumar, who personally visited the astronomy camp at MHR ground and shared his knowledge on locating low earth orbit satellites and objects through telescopes. He participated in a lively debate on the ISS, its activities and the Apollo landing on the moon. He emphasised on the importance of having new courses and curriculum to encourage students to take up astronomy and astrophysics activities in the Institute and praised the NISER Atronomy Club, Nakshatra Astronomy society of IITBBS and the NISER Student body for organising such a nice event. The participants were mesmerized by the beauty of the Craters of the Moon, Sirius Binary Star System, Orion Nebulae and various other astronomical objects.